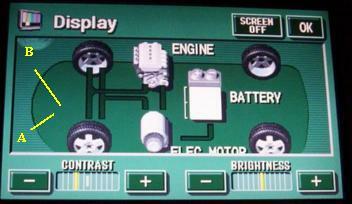 Holding the "Info" button down on the centre console while turning the lights on and off 5 times enters a service mode. Pressing and holding DISPLAY will exit back to the normal display set (energy/climate/audio). See also List-of-known-hacks at priuschat.com.